Freda Becher, was born 25 May 1901, the daughter of Heinrich “Henry” and Rosina “Rosa” (Schlenker) Becher. Freda was baptized at Zion Chatt on 12 June 1901, with Anna Maria Becher serving as her sponsor. Her christening name was Ida Freda Becher. Freda had 2 sisters, Carrie Louise (1898-1988), who married Theodore M. Leininger, and Martha Marie (1905-2001), who married Troy Woodruff. Freda’s father Henry Becher died of a brain tumor on 27 April 1906, at the age of 40, leaving his widow Rosina to raise their 3 young daughters. 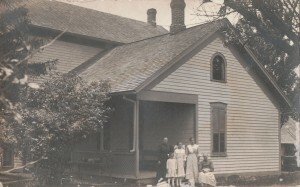 Becher home west of Chatt, 1914. L to R: Rosa (Schlenker) Becher, Martha Becher, Freda Becher, Carrie Becher, Anna Maria (Becker) Becher. 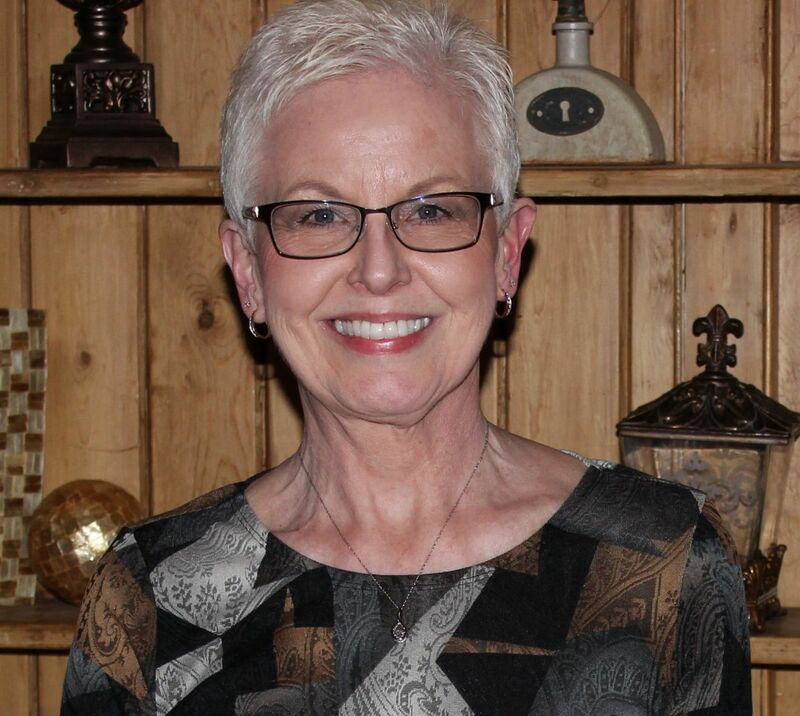 Photo courtesy of Dorothy Jean (Leininger) Hellworth. Freda Becher was confirmed at Zion Chatt by Rev. W.F.H. Heuer on 30 May 1915. Freda Becher married William Byer on 17 December 1921 at Zion Chatt. Zion’s Rev. Albrecht’s wife Clara was the witness to their marriage. William was 19 years of age, from Adams County, Indiana, and Freda was 17, from Chattanooga, Ohio. William Byer was born 12 September 1902, in Adams County, Indiana, the son of James Franklin (1875-1951) and Mary (Stetler) (1879-1940) Byer. 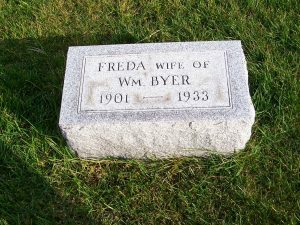 The surname Byer is spelled several different ways in the records—Byer, Beyer, Byers, but I am using the Byer spelling in this post, as inscribed on Freda’s tombstone. Freda and William Byer had 2 children, Rose Mary, born 22 June 1922, and Kenneth Lavern, born 19 July 1923. Both children were baptized at Zion Chatt. 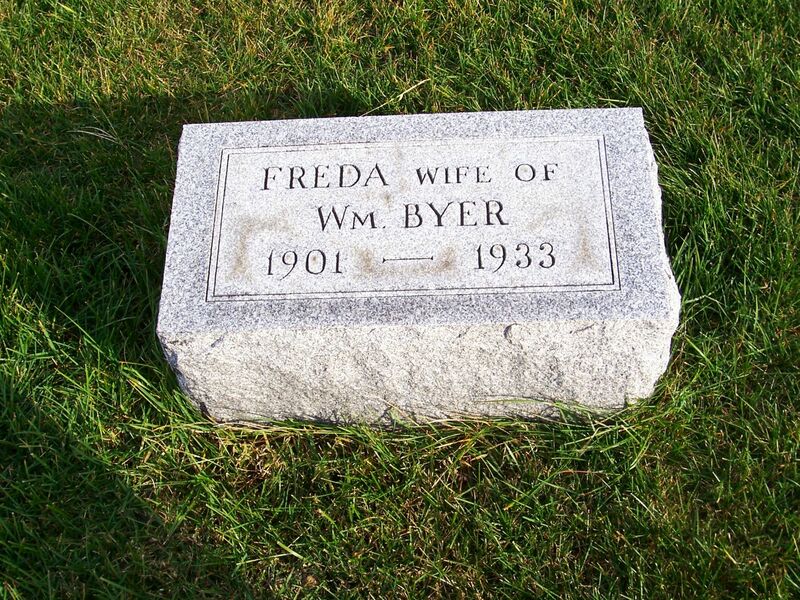 Freda (Becher) Byer died of the intestinal flu on 4 January 1933 in Blackcreek Township. She was 30 years, 7 months, and 10 days old and was buried on the 6th. Freda was survived by her husband, a daughter, a son, her mother, and 2 sisters. Ketcham’s was in charge of the arrangements. Widower William Byer married Marie Louise Haas on 26 November 1936. They were married by Rev. W.F. Johnson, of Berne, but their marriage license and return are in Mercer County. Marie Louise (1909-1994) was the daughter of Jacob and Philippina (Schaadt) Haas. William Byer died 21 June 1973 and is buried at Mercer Memory Gardens. 1910 U.S. Census, Liberty Mercer, Ohio, ED 119, p.18A, dwelling 396, family 347, Marie Becher; Ancestry.com; FHL microfilm 1375227, NARA microfilm T624, roll 1214. 1920 U.S. Census, Liberty, Mercer, Ohio, ED 140, p.11B, dwelling 225, family 243, Rosa Becher; Ancestry.com; NARA microfilm T625, roll 1418. 1930 U.S. Census, Black Creek, Mercer, Ohio, ED 1, p.1A, dwelling & family 10, William H Byer; Ancestry.com; NARA microfilm T626. “Ohio, County Marriages, 1789-2013,” database with images, FamilySearch.org, William H Byer & Marie Haas, 26 Nov 1936; Mercer County Marriages, Vol. 15 p.16, FHL microfilm 2366956.